I sent an old friend from Montgomery, TX my yearbooks from our 6th, 7th, and 8th grade years and she mailed me her senior year yearbook. I knew some of the students since I was seven years old. If we hadn't moved to Ft. Worth before my 10th grade year, I would have graduated with them. So it was genuinely interesting and also kind of heartwarming to see them in a way I hadn't seen them before: older than when I left them, about to embark on a new phase of their lives. After going through the Facebook Page I mentioned below, Mom decided to mail me some old photos I don't have and some other notes and tidbits she's kept over the years to add to the page. 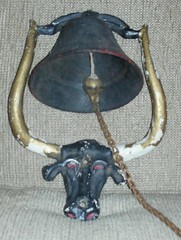 And, best of all, as a Christmas surprise, my brother mailed me an old wrought iron bell in the shape of a longhorn. We used to ring it when we wanted my horse Charlie Brown to come back to the barn for food or I wanted to saddle him up for a ride. It's been through a lot, not unlike me, my brother and mom. Looking at it brings back so many memories and I'm grateful to him for sending it. I'm going to hang it alongside an old kerosene lamp my mom mailed me a year or so ago. We used to use the lamp in the months before we had electricity. The knob to raise and lower the wick is rusted and stuck, so I doubt it will be in working order again but, like the bell, it's a lovely inspiration and a reminder of my country roots displayed in my New York City apartment.